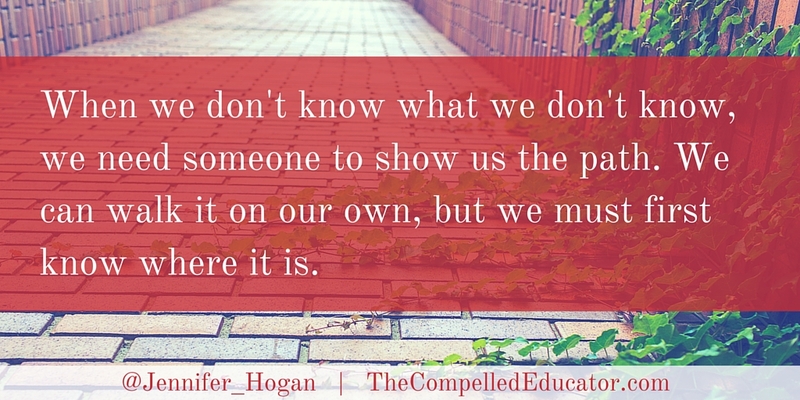 The Compelled Educator: When it comes to PD at your school, is anyone being overlooked? 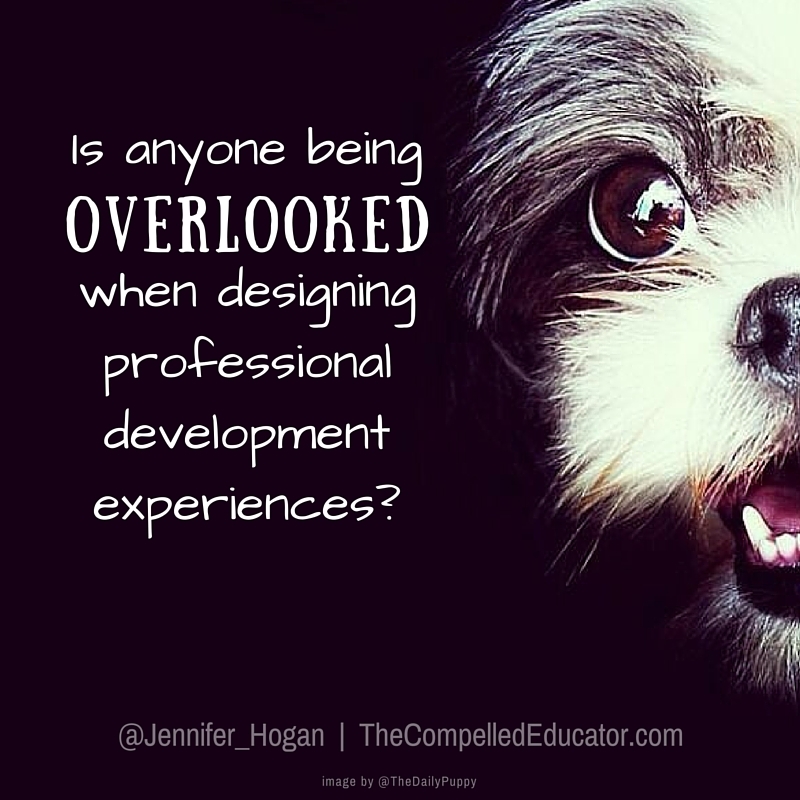 When it comes to PD at your school, is anyone being overlooked? In my role as Assistant Principal of Curriculum and Technology, part of my responsibilities is to create Professional Development experiences for our staff by leading or coordinating the opportunities. As a 1:1 school, there have been many opportunities for teachers to learn about flipped classrooms, dealing with distractibility in a 1:1 classroom, Google apps and extensions, Google Hangouts, and more. As the second semester started and I reviewed our PD plan and the schedule for the second semester, I knew there was a group that I wanted to intentionally design a professional learning experience for -- our physical education teachers. In every school where I have worked, there are teachers who feel often left out of the PD plans. Physical education, fine arts, speech, special education, and ELL teachers are the ones who usually feel like the PD sessions aren't applicable to what they do. As a believer in having an online PLN and seeking out my own learning opportunities, I am aware that PE teachers may seek out their own opportunities to learn outside of the school day and outside of the PD that we offer. In my commitment to our staff, I feel it is imperative to include all teachers in the PD that we offer at our school. 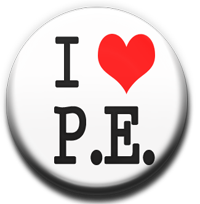 I'm a huge fan of physical education. Teaching students about living a healthy lifestyle that includes physical activity is one of the greatest gifts we can give them. My husband grew up in Laramie, Wyoming, and when he was in high school, they offered a class called Advanced Physical Education. To take the advanced class, the prerequisite was a grade of an "A" in regular P.E., and students in the advanced class got to do things like gymnastics, fencing, boxing, swimming, archery, bowling, and mountaineering. That sounds like an amazing program for students, and it sounds very different from anything I've seen in high schools around our state. It was something that I wouldn't have even imagined for a high school P.E. class unless he had told me about it. All of our P.E. teachers are coaches, too, and it can be difficult for them to find time to attend professional conferences due to coaching responsibilities. I knew Voxer would be an opportunity for our P.E. teachers to learn from other P.E. teachers across the country, and they could participate at their convenience. On the way to work, I reached out to Justin Schleider, a P.E. teacher in my PLN who is very active on Twitter and Voxer. I wanted his input on how I could help the P.E. teachers understand the value of connecting on Voxer. Justin replied almost immediately that he could create a Voxer group with P.E. teachers who could share their testimonials about the power of learning via Voxer. By noon, there were lots of teachers who had left their testimonials in the group. There were teachers from Saudi Arabia, Wisconsin, Alabama, New Jersey, Texas, and Georgia, to name a few! I couldn't wait to play the Voxes for our teachers! My first email to our P.E. teachers told them the date, the period we would meet, and that all they needed to bring was their phones and their favorite quote about commitment. These are 5 of the 8 P.E. teachers that I was going to meet with, and this is the last version of the picture. 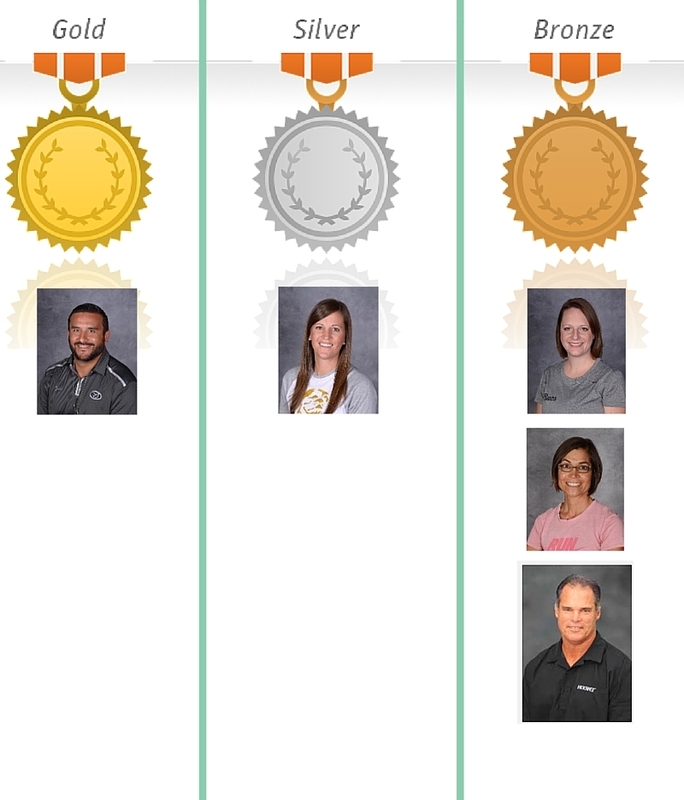 The first one I sent had one teacher in the bronze column. Quickly, there were more pictures added and movement between levels. Competition is a motivator, especially with coaches! When the day finally arrived, I started the meeting by having the teachers to share their favorite quotes about commitment. I also asked them why they thought I had them to bring quotes about commitment. The common understanding was that we must be committed to learning about our craft and getting better as educators for our students' sake. I then connected my phone to the speaker in the room, and played most Voxes from the Voxer group that Justin created. I asked our P.E. teachers to take notes as they listened. I wanted them to capture any "aha" moments or anything they heard that they liked about using Voxer for professional learning. They then shared with the group, and placed their sticky notes on the whiteboard in the room. I created a Voxer group called "HHS PE Teachers" just for our teachers, and I asked them to Vox one thing they liked that they had heard that morning. I also told them that I would be posting a few questions in the group and wanted them to respond. I also shared a list of resources for them, which include the National Lesson Plan Creator, PE Google Drive, and a list of Voxer PE chat groups. After the meeting, I compiled the ideas from their sticky notes and sent the list to them via email. Click HERE to see the ideas they noted. What unit have you taught that you would like new ideas for? Perhaps it's a unit that you've been teaching for a long time, it's stale, you're bored... you would like to re-vamp the unit or freshen it up. Which unit would that be? What unit have you read/heard about that you've NEVER taught but would really like to? I'm looking forward to seeing how our teachers respond to this new information about professional learning. It's a different way of thinking about PD, especially for our PE teachers and coaches. I hope they will take advantage of this opportunity to learn and stretch themselves - the very things we ask of our students! Would there be a way that I could allow my PE teacher to join this group?